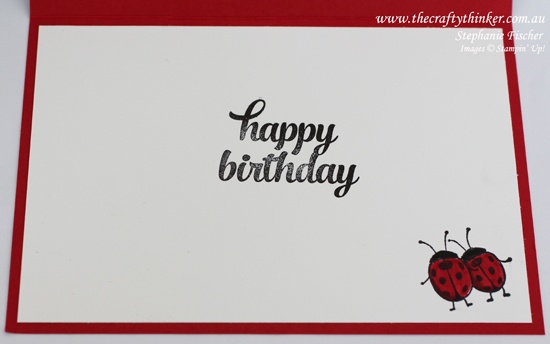 I made this card for one of my little great nephews. I rarely see him since he lives interstate and so I don't really know what he likes but I figured who doesn't love ladybirds and little boys like to collect things in jars - well they did in my generation! I suppose now they prefer to catch things on a smart phone! Do little boys still like to collect things in jars? To make the shaker part of the card, I basically followed Sarah-Jane's tutorial (click here to link to her video) for making a shaker without using foam, however, I omitted the DSP layer. 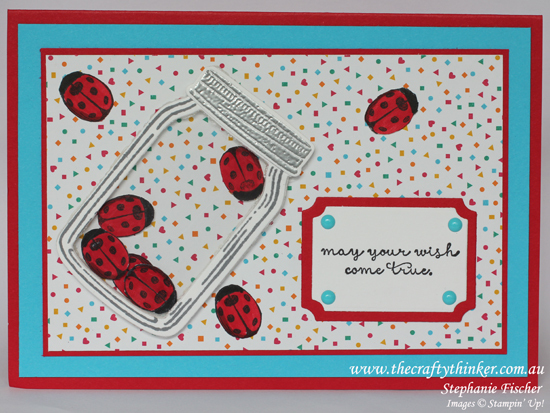 I simply piled the ladybirds onto the card front and stuck the jar over the top. I like to think that all the ladybirds have now escaped and these are the last two happily going home!